In stock - low quantity. Order in the next 3 hours, 54 minutes and it will go out today! Tomas Medina specializes in geek magic. He's a funny, charming and entertaining magician and we're confident that you'll enjoy his DVD. 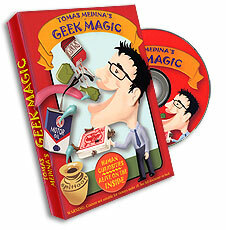 The DVD features some of Tomas' best geek style routines. And by geek magic, we mean weird stuff that you won't find anywhere else! For example, Tomas teaches you how to apparently shove Tic Tacs in your eyes (my favorite trick from the DVD), drink motor oil, drink the spit of several members of your audience and even produce live bugs (the weirdest card trick ever!). These are all tricks, of course - there are methods to this madness! As you can see, it's a collection of gross magic. But, that's exactly what some performers are looking for to make them stand out. You won't be able to use any of the tricks for your granny's birthday party, but you will be able to freak out your friends at the bar.